Hai Lang Hao pu-erhs have garnered quite a reputation and so deserve a closer look from anyone wanting to delve further into this wonderful tea type. Tea master Ji Hai from Hai Lang Hao is an old customer of Zheng Si Long factory in Yiwu, and goes there every year to press his cakes. These cakes have generally been stored well, so that older cakes are well-aged. Some are sold under the “Ming Xiang Ya Yuan” brand (the name of his shop), which was used on his 2002 to 2006 productions. 2002 Hai Lang Hao “Mengku Wild Arbor” cake — An early Hai Lang production using Spring 2002 Mengku area (County of Lincang) wild arbor (not ancient) raw material in these medium compression cakes. This 400-gram cake is a true single-estate hand-processed tea. The liquid is a bright orange color with a nutty and full flavor yet still with plenty of “cha qi.” Stored in Hai Lang’s Kunming warehouse since 2002. Very clean and nicely semi-aged tea. 2005 Hai Lang Hao “Lincang Impression” Raw Pu-erh — A small production with a special heavy pungent “cha qi” by Hai Lang Hao in 2005 under the “Ming Xiang Ya Yuan” brand. Made entirely from Yong De area early spring tea and more tightly rolled than many other Mengku area teas. It has plenty of textured flavors, having aged for almost 6 years, in the thick liquid with its sweet after-taste with a touch of bitterness. 357 grams per cake. 2007 Hai Lang Hao “Jing Mai Mountain Wild Arbor” Raw Pu-erh — This first production 357-gram cake from Hai Lang Hao is composed entirely of first flush Spring 2007 raw material. There is 70% Wild Arbor material blended with 30% plantation material from Jing Mai mountain grown at 1600 to 1800 meters altitude. This is premium sun-dried “mao cha” in a limited edition cake. A September 2007 pressing produced in Jing Mai Mountain of Lan Cang county. 2008 Hai Lang Hao “Lao Ban Zhang & Man’E Ancient Arbor” tea — The second and final Hai Lang Hao production of 2008, composed of entirely first flush material, and the most premium wild arbor tea since the legendary 2006 Lao Ban Zhang production. This 400-gram cake is produced from ancient wild arbor tea trees from Lao Ban Zhang village and from neighboring Lao Man’E village, both in the Bu Lang mountain range in the far southwest corner of Menghai county. This 50/50 blend is strong and pungent, characteristic of Bu Lang mountain area teas. An incredible tea sure to please discriminating tea drinkers yet at an affordable price. 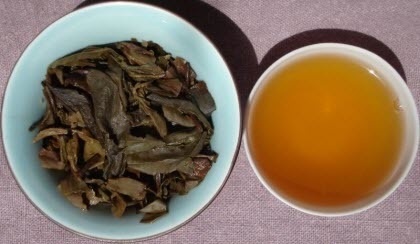 Contains Yunnan Large leaf varietal sun-dried tea. Produced by Hai Lang Hao (pressing at the Ye Zhuang Shuang Li tea factory). These are truly fine limited edition pu-erhs that you will surely enjoy. See also: What’s So Special About Mengku Tea? This entry was posted in For Pu-erh Devotees and tagged chinese tea, JAS-eTea, Pu-erh Teas. Bookmark the permalink.